Chemmeen Ularthiyathu (prawns Roast) is a lip-smacking seafood cuisine of Kerala and the aroma and the flavor is something you will never forget and always yearn for. Alleppey region is famous for its scenic beauty and exceptional seafood fare. The taste and variety of seafood cuisine here is amazing! You will love the Alleppey fish curry, Mathi Peera, Alleppey Chemmeen curry, Chemmeen manga thoran, Meen Mutta thoran, Kakka Irachi, Crab roast, Naadan Ayala curry, Karimeeen Mappas, Squid roast etc. Kuttanadan Tharavu Roast and Beef Fry are also exceptional. You might also like my Spicy Prawns Masala (Andhra style) and Prawns in Coconut milk curry, (a specialty dish from Island country) etc. Unakka chemmeen Chammanthi and Unakka Chemmeen Mango thoran are special dishes with dried Prawns. Kerala Prawns roast is a popular dish, and popular among tourists. The curry leaves, coconut oil, Coconut pieces, Kudampuli and other spices join together to make this extremely delicious! My beloved Ammamma (my aunt) is my inspiration in creating this fantastic Kerala style Chemmeen Ularthiyathu/ Prawns Roast recipe. She was an expert in cooking anything and everything and her delicious food was filled with flavours, aroma, taste and all love. We used to call her home “Ammamma’s lunch home”, where everyone had their fill. She was an expert as I told you, and her Chemmeen Ularthiyathu (prawns Roast) was quite illustrious. The way she would clean the prawns so swiftly, is still embedded in my memories. And the aroma afterwards from her kitchen still lingers in my mind. Miss you dear Ammamma! How I wish you were here to see my blog!! 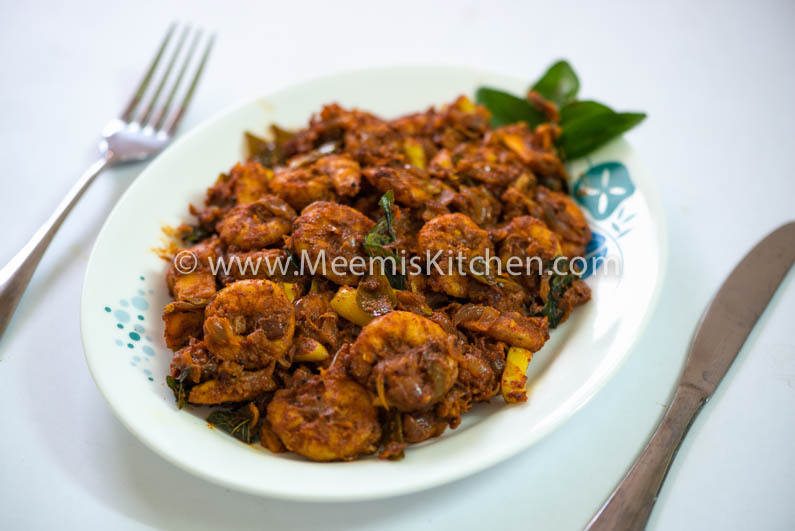 Chemmeen / Prawns, used by Ammamma was quite small compared to what I get here, and I have made small changes to her recipe, and it is a super delicious dish and I am sure you will love it instantly. 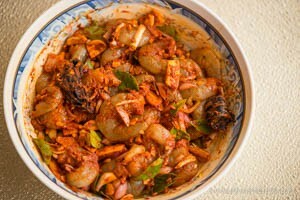 So try this mouthwatering Kerala Chemmeen Ularthiyathu / Prawns Roast recipe and let me know the results. Enjoy! Clean and devein Prawns and keep aside. Slice the small onions, slit green chillies, slice garlic and chop ginger. Clean the Kudampuli. Add Chilly powder (3 ½ tsp), Coriander pdr, Turmeric powder, salt, curry leaves and ½ tbsp. oil to the prawns. 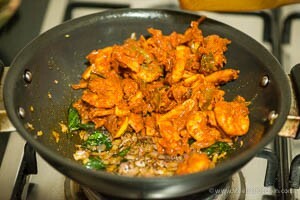 Also add Kudampuli and the chopped/ sliced ingredients to the prawns and mix well. Keep it covered for half an hour. Cook the marinated Prawns in a pot (Manchatti/ earthen pot is ideal) on a small flame, adding/ mixing half cup water to it. When the water is almost used up, the prawns will be cooked leaving very little gravy. Heat the rest of the oil in a Kadai, pop mustards and add chopped onion and curry leaves and sauté. When it is translucent, add remaining Chilly Powder, pepper powder and Garam Masala to it. 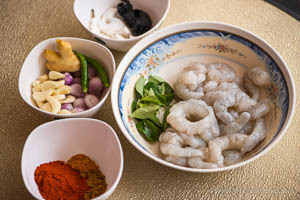 Mix the cooked Chemmeen (Prawns) and stir fry for few minutes till the gravy is thickly coated on the prawns. Serve hot. Chemmeen (Prawns) Ularthiyathu is great with Rice. Green chilly should be medium spicy. If it is too hot, add only one. The spice measure mentioned here is above medium spicy, if you want it spicier please increase the Chilly powder. Always cook prawns on small flame. Please try and let me know if you like it. God Bless! !